Home / Specials / Gaza’s Water Crisis / Why is There a Water Crisis in Gaza? So what caused this catastrophic environmental crisis? And why is so little being done to remedy the situation? 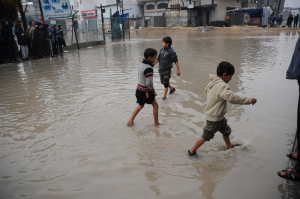 Experts, local authorities and international organizations have been warning for decades that overpumping, pollution and seawater intrusion into local groundwater pose a severe risk to public health and environmental sustainability in the Gaza Strip. The answer lies in a combination of factors that come together in a seemingly inescapable vicious cycle of destruction. The following sections show how a number of mutually reinforcing elements – rapid population growth; the overpumping and pollution of local groundwater reserves; and the ongoing conflict with Israel – have driven the slow collapse of Gaza’s Coastal Aquifer. 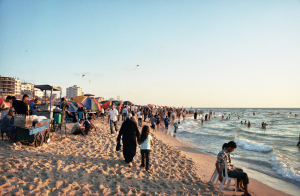 The beach at Gaza, 2006. Photo: Gus. Covering just 365 km2 of land on the shores of the Eastern Mediterranean (Fig. 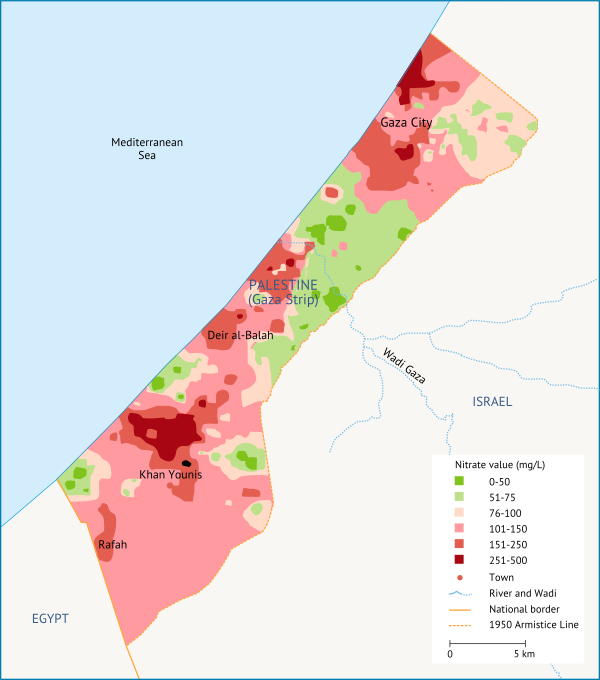 1), the Gaza Strip has a population of 1.76 million inhabitants. It is one of the most densely populated places on earth, with an average of more than 4,500 inhabitants per square kilometre (inh/km2), rising to 20,000 inh/km2 in urban areas. A high birth rate: Gaza’s population growth rate was estimated at nearly 3.45% in 2014, compared to 2.6% in the West Bank. Gaza’s population is young, with around 43% under the age of 14. The influx of more than 197,000 refugees after the creation of Israel in 1948. Today more than 70% of Gaza’s population are refugees. Going forward, the UN estimates that the population of the Gaza Strip will reach 2.1 million in 2020, pushing average density levels up to 5,835 inh/km2 in 2020 and more than 20,000 inh/km2 in urban areas. Rapid population growth in the Gaza Strip has placed considerable pressure on natural resources, particularly water resources. Gaza relies almost entirely on groundwater, with 98% of its water supply coming from the Coastal Aquifer (Fig. 2). The remaining 2% is bought from the Israeli water company Mekorot. Figure 2. The Mountain Aquifer and the Coastal Aquifer. Source: Fanack after UNEP/GRID-Geneva, 2002. 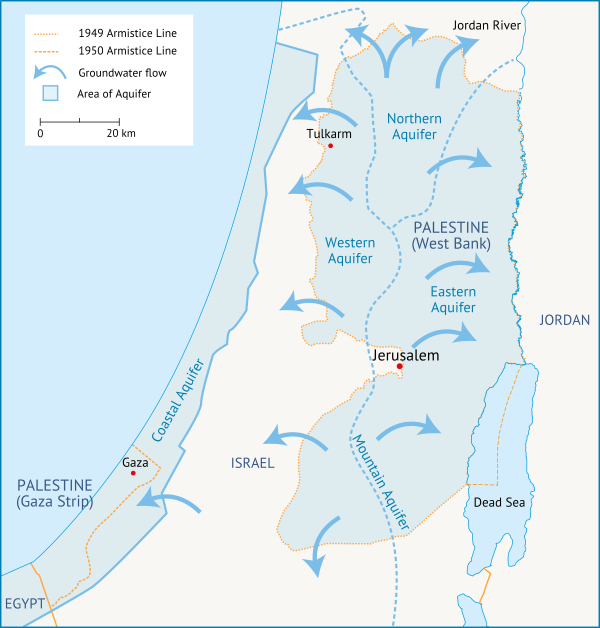 This shared aquifer is also used by Israel and Egypt, but while these countries have alternative sources of water, the Gaza Strip relies entirely on the Coastal Aquifer. 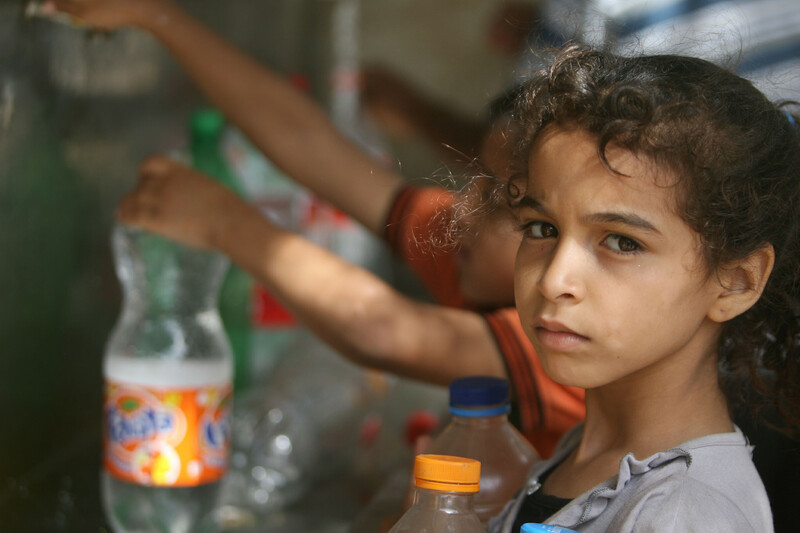 As demand for water from the expanding population has increased, the rates of abstraction from the aquifer in Gaza has gradually exceeded the rate of natural replenishment. 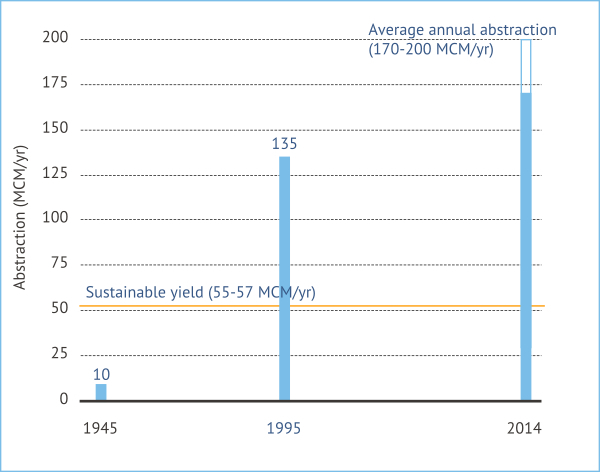 Today, annual average abstraction lies at 170-200 MCM/yr, three times as high as the aquifer’s sustainable yield (the amount that can be safely abstracted) of 55-57 MCM/yr (Fig. 3). Figure 3. Overextraction from the Coastal Aquifer in the Gaza Strip. Source: Fanack based on Messerschmid, 2011; UN-ESCWA & BGR, 2013; PWA, 2014. Overabstraction from the Coastal Aquifer has caused groundwater levels to drop by 10-20 m over the last 40 years (Fig. 4), allowing saline water to seep into the aquifer from the Mediterranean Sea to the west and from deep groundwater in Israel to the southeast (Fig. 5 and 8). Figure 4. Decline of groundwater levels in the Gaza Strip during the period 1967 and 2013. Source: Fanack after PWA, 2014. The salinization of the aquifer is monitored by assessing the concentration of chloride in wells across the Gaza Strip. According to World Health Organization guidelines, chloride levels should be below 250 mg/L in order to be suitable for human consumption. However, in Gaza only around a quarter of the municipal wells meet this standard. Chloride concentrations vary from 250-600 mg/L in the north of the Gaza Strip and west of Khan Younis to 600-2,000 mg/L elsewhere. Along the coast, levels exceed 2,000 mg/L and can reach more than 10,000 mg/L due to seawater intrusion (Fig. 5). Figure 5. 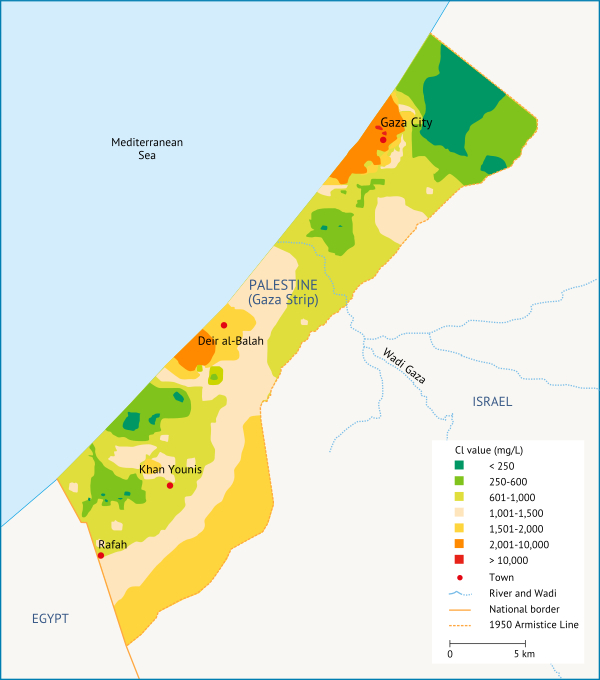 Chloride concentration in the Gaza Strip. Source: Fanack after PWA, 2014. Caption: Floodwaters mix with raw sewage in the Sheikh Radwan neighbourhood of Gaza after winterstorm Alexa hit the Gaza Strip in December 2013. Photo: Karl Schembri/Oxfam. In addition to saline water infiltrating into the groundwater, the Coastal Aquifer is also increasingly polluted by raw sewage and other untreated wastewater. Every day, around 90 million L of untreated or partially treated sewage seeps into the groundwater and flows into the Mediterranean Sea due to the lack of properly functioning water treatment facilities. This has resulted in high levels of nitrates and other pollutants in the groundwater, which is particularly dangerous for infants and children. According to the Palestinian Water Authority, which monitors nitrate concentration in 211 municipal wells, 87% of the wells have nitrate levels that exceed the WHO limit of 50 mg/L, with concentrations of over 200 mg/L in some places (Fig. 6). Nitrate pollution is difficult to spot, since it is colourless, tasteless and odourless. This makes it all the more dangerous, as people often keep using water with high nitrate levels until they are told about the health risks (Fig. 6). Figure 6. Nitrate concentrations in the Gaza Strip in 2009. Source: Fanack after PWA, 2011. Note: The internationally accepted guideline for nitrate in drinking water is 50 mg/L. Together, the pollution by nitrates and chloride render almost all of Gaza’s water unfit for human consumption. According to the Palestinian Water Authority, in 2014 less than 4% of the domestic water supply was fit for human consumption (Fig. 7). Figure 7. 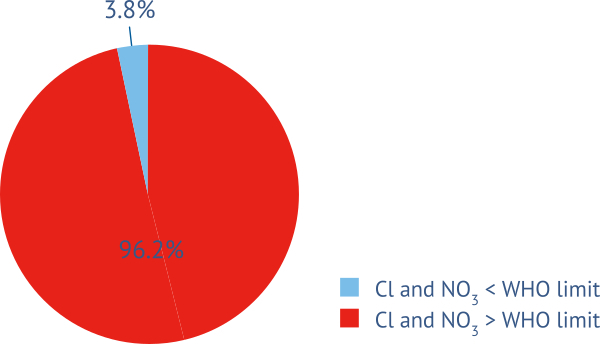 Nitrate and chloride concentration in groundwater in the Gaza Strip and amount of water suitable for human consumption. Source: Fanack after PWA, 2014. Local authorities, international organizations and water experts have been warning for years that if no measures are taken, the aquifer will “collapse”. This means that all the groundwater will become totally salinized and contaminated, and water will need to be supplied from a different source. This would entail the loss of around 55 MCM/yr of otherwise usable water. According to a 2011 report, the cost of resupplying such a volume would amount to approximately $300 million, with ongoing costs of at least $0.55/m3 for fresh water produced through desalination to replace the contaminated supply. Figure 8. 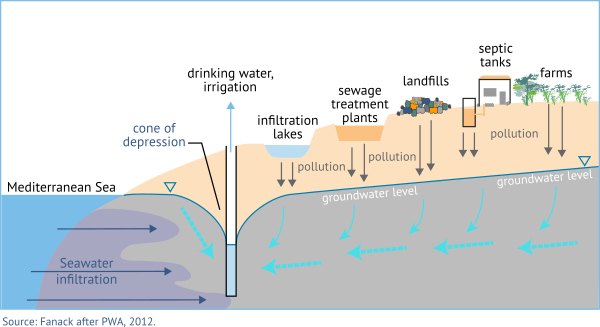 Sources of groundwater pollution in the Gaza Strip. Source: Fanack after PWA, 2011. 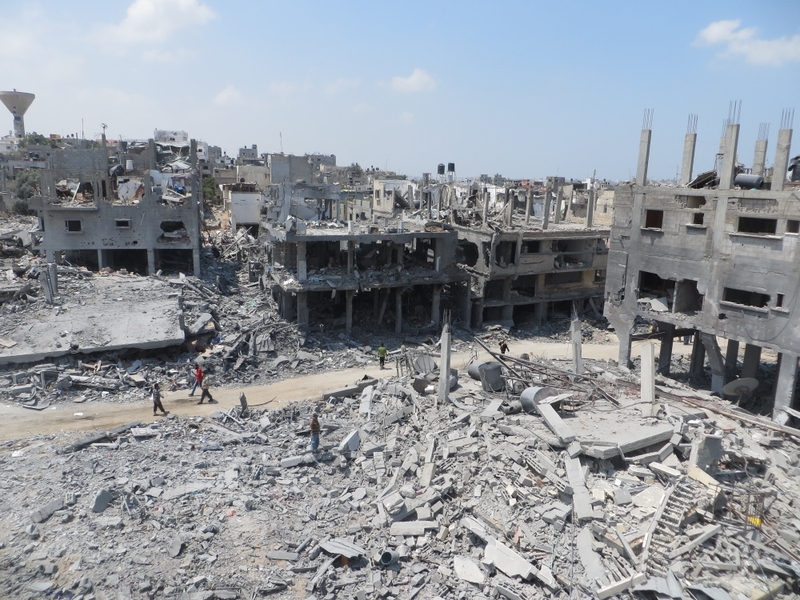 Ruins in Beit Hanoun, Gaza Strip, August 2014. Photo: B’Tselem. 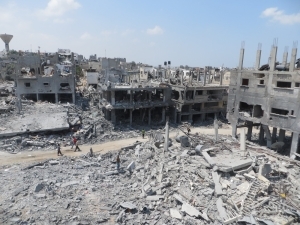 The situation in Gaza is worsened by the damage caused by Israel’s periodic military assaults (Cast Lead, 2008-09; Pillar of Defense, 2012; Operation Protective Edge, 2014), which have resulted in extensive damage to water production and wastewater treatment infrastructure. Moreover, the ongoing Israeli blockade that has been in place since 2007 prevents the import of building materials for reconstruction and other items required to maintain and operate water and sewage systems and treat water to adequate levels. Even simple items like membranes for water filters and chlorine to disinfect water are often unavailable. Two years before the 2014 military incursion in the Gaza Strip, the United Nations issued a report assessing living conditions in Gaza in 2020. The study stated that Gaza’s population would increase from 1.6 million in 2011 to 2.1 million in 2020, and concluded that “herculean efforts” were required in the health, education, energy, water and sanitation sectors if Gaza was to be a liveable place in 2020. Instead, the situation has further deteriorated. Following Operation Protective Edge, which lasted from July to August 2014, the UN reported an estimated $34 million in damage to Gaza’s already ailing water infrastructure, including damage and destruction of 20-30% of water and sewage net­works, 30-50% of water storage tanks and reservoirs, 220 agricultural wells and damage to the wastewater treatment plant at Deir al-Balah. More than a year after the ceasefire, reconstruction has not started in many areas because of a lack of funding and materials, and water shortages remain a daily worry for most Gazans. According to a 2015 UN report, the ongoing conflict has led to the de-development and impoverishment of Gaza. The same report states that long-term repair of the accumulated damage and decay of the water and sanitation infrastructure will require funding in the order of $620 million.